This is an English Daisy. This is exactly how I found it. I used my Macro Lens and extension tubes again, which gives it super close up and you get to see the delicate flower with intricate details. The flower is really small, but looks so big with the macro Lens. By the if you want to explore Macro photography but don’t want to spend extra money on expensive lenses. Try out extensions tubes like Kenko – link below – as these are good cheaper alternatives. Just make sure you select the ones with that fit your camera make. Enjoy. Colors are beautiful. And thanks for the tip on the extension tubes. I’ve been thinking about that. I’ll check it out. Thanks Gina. They are pretty tricky to work with and you have to get in real close. 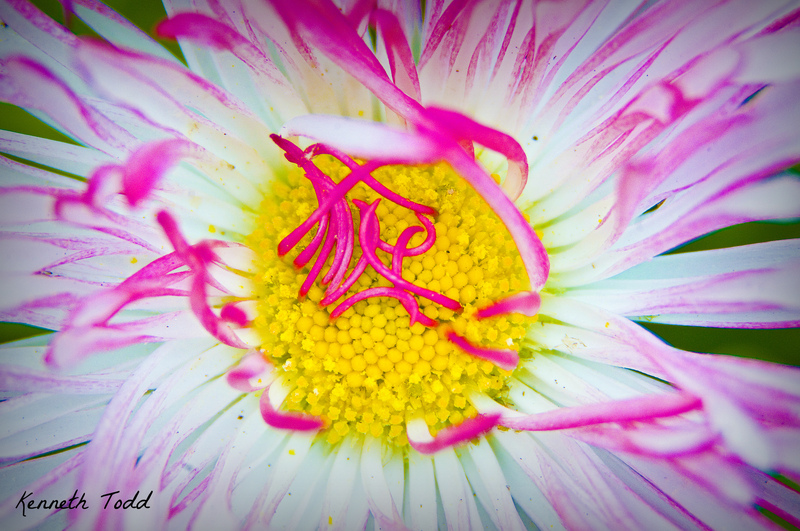 Fantastic macro shot, and not a typical “Kenneth Todd” Great job ! It’s so beautiful! Excellent shot. I must check out extension tubes – they seem to work really well. Gorgeous colour captured. What was the technical set you used in the camera?